Thus far, Beijing has found little wiggle room to resist the U.S.-E.U.-Saudi common vision that severe sanctions be used to shut down the bulk of Iran’s oil exports by June. The reality being revealed in this confrontation is that China has much less ability to maneuver independently in the global oil system—whether in the market or in diplomatic and military matters—than most analysts would lead us to believe. Preface: What are Washington v. Beijing´s strategic objectives here ? In my assessment, there are clear underlying energy’market security reasons why the U.S. is pursuing this geopolitical path. The U.S. aim is to prevent Iran from projecting greater influence over key Gulf oil-market players Saudi Arabia, Iraq, the UAE, Kuwait and etc. as the U.S. withdraws from its over-extended presence in Iraq and Afghanistan. This draw-down is very important for U.S. strategy globally; but Washington will not accept Iran gaining greater influence over other local OPEC producers and thereby the global oil market (aka, The Global Barrel) as it steps back. Stopping any Iranian nuclear program is of course a significant part of this; but really, for Washington, the more general issue is that if sanctions were lifted, Iran would soon become the oil powerhouse it is ultimately destined to be, its income would grow rapidly and its conventional military capacity along with it. Nuclear weapon or no, Iran would increase its regional weight, and, considering the region, gain a level of world oil-market clout the U.S. and its allies (whether local or European) deem unacceptable. As for China, its oil policy is essentially hostage to this conflict. It can clearly not project significant power in the Gulf region to avert the conflict, nor its basic outcome. It also cannot now risk a major worsening of its relations with the U.S. and its allies. So, Beijing has to defend its energy security interests, which now include both short- and long-term oil relationships with Iran, but yet find a way to “go along, get along” with the U.S. and its allies on this issue. 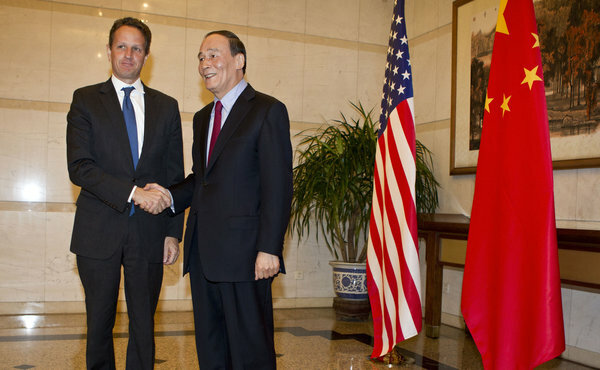 As I mentioned in a previous post, U.S. Treasury Secretary Geithner went to Beijing early in the year, on January 9, after Obama signed the new U.S. sanctions law late in December. He went to “urge” Beijing to stop buying Iranian oil. This included an ultimatum. Beijing was told to stop buying oil from Iran (in stages would be fine), or else Chinese banks found to be making payments to any Iranian bank for that oil, including to Iran’s central bank, will be barred from doing business with U.S. banks. And, the EU has since passed its own sanctions which basically do the same. And, then, within days of Geithner’s visit to Beijing, China’s Premier Wen Jiabao went on a five-day visit to Saudi Arabia and its allies in the Persian Gulf. This trip is quite interesting as it´s the first time in over 20 years that a Chinese premier has gone to see the Saudis. Just for some sense of comparison here: in Venezuela, PDVSA and the state under Hugo Chavez have accepted about $36 billion in loans from China. Even if one assumes say, another $10-to-20 billion Chinese investments in Venezuelan oil fields, Iran’s $120 billion investments–only since 2009–are immense by comparison. Premier Wen’s visit to the Gulf, yet skipping Iran, should be seen in this light. Along these lines, the key aspect of the visit is that Premier Wen was also assured by the Saudis that they would make up for the Iranian oil imports China would lose if it gets on board U.S. sanctions [There was a good lead on this in Petroleum Intelligence World: “Saudis Play Silent Role in Iran Sanctions” PIW, Vol. LI, No. 4, 30 Jan 2012], and the Saudi’s had some interesting business deals to offer. First, they offered a new, significant stream of oil imports from the Saudi’s presently ample surplus capacity. Outside PIW and some industry-insiders, the fact that this is a relatively advantageous time, from a market perspective, for the U.S. to push for sanctions on Iran, has not been stressed. World demand is down and the Saudi’s have a significant surplus production capacity, probably about 2.5 million barrels that they can use to wean Beijing from its Iran dependency. This entry was posted in China, Energy and Environment, international relations, OPEC, The USA, U.S. oil, Uncategorized. Bookmark the permalink. Fascinating as usual. You think that these geopolitics have affected the US’s changing position on the Keystone pipeline? If Keystone doesn’t happen, more Canadian oil goes to China — and Canada, of course, is even more in the US pocket than Saudi Arabia. I don’t think the Keystone and the present Iran sanction are linked that directly vis-a-vis U.S. diplomacy towards China. However, more generally, the U.S. attitude to China’s increased role in the W. Hemisphere oil sector has been basically very welcoming. That’s consistent with U.S. interest in getting more oil online generally from more diverse sources. A complaint from the US side about China, however, is that with Venezuela and anywhere else possible, China tries to make these as bi-lateral, state-to-state, mercantilest tie ups avoiding oil-market participation, market pricing, etc. The U.S.(and most everyone else) sees this as market-distorting. However, with China’s new opportunities with Keystone’s possible failure, and with China’s big new investments in Alberta oil fields, China is forced to participate in the market just like everyone else–which only consolidates it into the “one global barrel” system, where the US is the mover-and-shaker/protector. The U.S. really quite strictly seems to want China to feel taken care of fairly in the oil sector (vis-a-vis Iran or the W. Hemisphere), and be drawn into dependence/reliance on the global market system.